While teaching English in South Korea, I once asked an adult student what Korean dish he would fix for someone who had never eaten Korean food before. He didn’t hesitate. “Bibim Bap,” he told me. It’s healthy, delicious and — most importantly for a bachelor like himself — easy to prepare. Bibim bap, which translates to “Mixed Rice,” (and is sometimes anglicized “bibimbap,” “bibimbop,” or “bibim bop”) is a popular Korean comfort food with a myriad of incarnations. Typically, it’s rice topped with vegetables (julienned carrots and radish, cooked spinach, mushrooms and bean sprouts are common), thin strips of cooked beef, a fried egg, sesame oil and sesame seeds. It can be served a number of ways — in a hot pot or cold; vegetarian; or with seafood and any variation of vegetables — depending on the region in which it’s made. The uniting factor in all Bibim Bap is Gochuchang, a spicy-sweet red-pepper paste that’s usually served on the side and mixed into the dish at the eater’s discretion, providing the rice with a red-orange tinge and distinctive flavor. It’s mouth-watering, but not a glamorous meal, as Paul Kim of House of Seoul in Airway Heights explains: “A lot of times it’s made with leftovers” (though not in restaurants, that’s illegal). There’s always rice on hand, he says, and with vegetables from the night before, a quick fried egg and few squirts of pepper paste, you’ve got dinner. Kim’s Korean Restaurant, House of Seoul and Ha Ha’s Grill House all serve the staple dish with gusto and subtle variations. The restaurant owners shared some of thoughts on one of Korea’s quintessential dishes. If you want to experience a bowl of Bibim Bap that tastes like one you’d get in a small mom-and-pop restaurant in Seoul, visit Kim’s Korean at 1314 N. Division. Adjacent to small Korean grocery. Kim’s serves Bibim Bap with a combination of local and Asian veggies, plus kimchi. 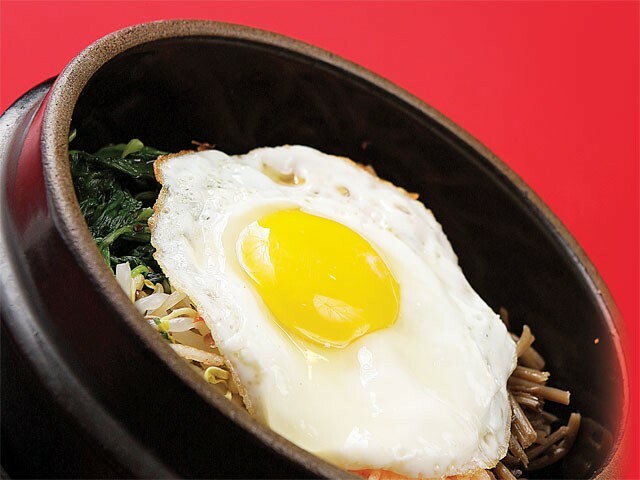 Strips of marinated beef and an egg fried just right — so that the runny yolk breaks, coating the rice, when the dish is mixed — give Kim’s Bibim Bap a hearty flavor. They also add salty dried seaweed. much like bacon, it makes everything better. Kim’s pepper sauce is more sweet than hot, which is great for people with a low tolerance for spicy food. Those who want to burn their tongues off can always mix more kimchi into their Bibim Bap. “Korean people don’t have salad, not like your salad,” says restaurant owner Chong Kim, who emigrated from Korea in 1985. Bibim Bap, she says, is their equivalent. At House of Seoul (12713 W. 14th Ave., Airway Heights), Paul Kim (no relation to Chong Kim), who originally trained as a Japanese chef, now cooks the food he learned to make growing up in South Korea. House of Seoul serves Bibim Bap in a bowl, as it’s served at Kim’s, but also in a hot pot — a variety called Dol Sot Bibim Bap. The highlight of Dol Sot Bibim Bap is the rice at the bottom of the bowl. The hot pot sizzles like fajitas and keeps cooking that bottom rice until it’s crispy and delicious — a perfect way to end the meal. Making Bibim Bap in Spokane is a little difficult, explains Kim. “Korea is a much smaller country, so you can get very fresh vegetables for very cheap that you can’t get here,” he says. He makes due with more “American” veggies. His wife, Miwha Kim, thinks that Bibim Bap is experiencing a resurgence since President Obama ate Bibim Bap with South Korean President Lee during his visit to South Korea last year. She remembers making Bibim Bap as a child as a part of celebrating the dead. “The last day of their life, we prepared a lot of food. We made Bibim Bap and shared with the village — now they probably don’t do that,” she says of her small-town upbringing. No one knows exactly who first started making Bibim Bap or why, but Miwha Kim was able to share a few theories. “According to the literature, Bibim Bap started being made in the late 1800s. One theory is that it started with poor people, because everything is in one dish. Another is that soldiers started making it because when they went to war, it was hard to provide nutrition, so they put everything in one dish,” she says. It’s easy to question the authenticity of Ha Ha’s Grill House, because it serves Korean food plus American café-style salads and sandwiches — think about Chinese places that also serve grilled cheese — but enter with an open mind. Ha Ha’s opened six months ago at 2710 E. Garland Ave. and is operated by John Ha, a Spokane native born to Korean parents. Like Paul Kim and Chong Kim, Ha learned to cook at home, picking up a few skills from his sous-chef brother. Ha’s version of Bibim Bap is “all about the presentation.” To emphasize the freshness of the vegetables, the rice is served separately, instead of in the bottom of the bowl underneath the vegetables. Ha includes surprising ingredients like lettuce strips, bell peppers and Asian pear. Ha’s sauce is on the spicy side, and the Asian pear, which Ha describes as “that something special,” provides a much needed relief to the heat of the sauce. Driving home from Ha Ha’s, I’m suddenly back in South Korea, sitting across the lunch table from a 6-year-old student named Helen as she heaps all of her lunch items onto her rice. “It’s special Bibim Bap,” she informs me proudly, while mixing rice, kimchi, spicy squid, sweet red beans and tiny dried anchovies before loading up a spoon and shoveling it in. “How is it?” I ask. She gives me a big thumbs-up, grinning goofily through a mouthful of rice. Around the table, other kids start following her example.